Happy Valentine's Day to you all! 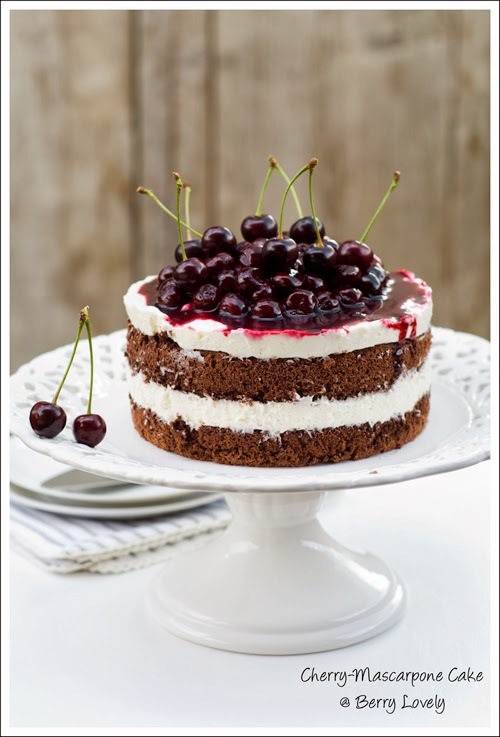 This cake combines two of my Valentine's Day favorites: chocolate and cherries. It's not difficult to make, but still looks very special. It also comes in a small size, which makes for a perfect Valentine's Dessert for you and your sweetheart. Preheat the oven to 180° C (350° F). Line an 18 cm (7-inch) round springform pan with parchment paper. Separate the eggs. Beat the egg whites with 2 tbs. of cold water and a pinch of salt until medium peaks form. Slowly add the sugar while beating, and beat until you have firm peaks. Add the egg yolks one at a time and the vanilla extract. Beat until just incorporated. Mix the flour, corn starch, cocoa powder and baking powder. Sieve on top of the egg mixture and fold together with a spatula. Fill in the prepared form and bake for about 20-25 minutes. Let cool on a wire rack. Soak the gelatin in cold water. Using a wire whisk mix together the mascarpone, quark, sugar and vanilla extract. Put the gelatin on mild heat and stir until dissolved. Add a few tablespoons of the quark mixture stir together. Add to the remaining cream. Let cool for about 10 minutes. Whip the heavy cream and fold into the quark mixture. Cut the cooled cake lengthwise into two layers. Put the lower layer on a cake plate and put a cake ring around it. Sprinkle with 2 tbsp. of Kirsch. Fill half on the cream on top. Put the second cake layer on top and sprinkle with the remaining 2 tbsp. of Kirsch. Fill the remaining cream on top and level with an offset spatula. Put the cake in the fridge for at least two hours. Mix 2 tablespoons of cherry juice with the corn starch. Bring the remaining juice with the sugar to boil. Add the corn starch mixture and cook until thickened. Add some Kirsch if using. Take off the stove and let cool. Take the cake out of the fridge and remove the cake ring. Arrange the cherries on top of the cake. Distribute the juice on top of the cherries, you might not use all of it. Cool until serving.